1- Preheat your oven to 450F. Put the waxy potato rounds in a saucepan and add enough water to cover by 1 inch. Bring to a simmer and simmer until tender but still holding their shape, a small knife should slide in and out easily. Do the same for the sweet potato rounds, in a separate pan. Drain all the cooked rounds well and season them with salt and black pepper. 2- Oil the bottom of a large baking sheet. 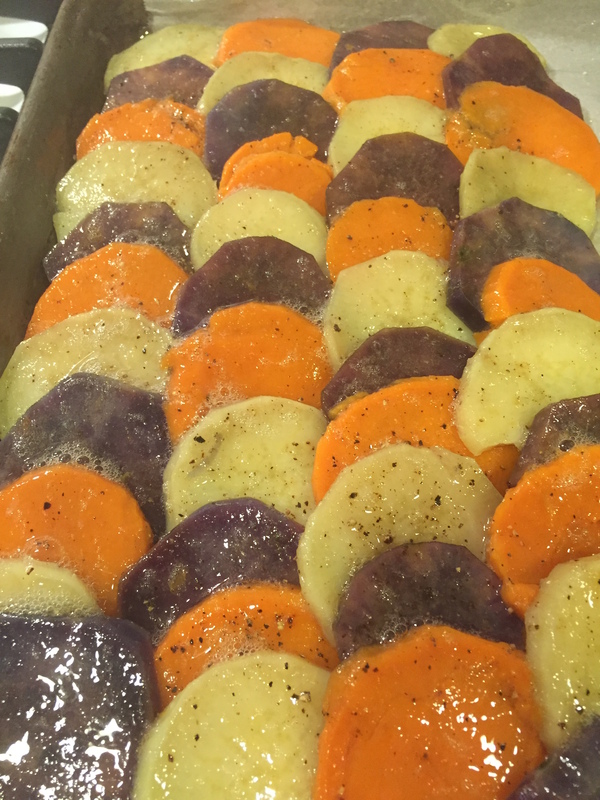 Shingle the potatoes and sweet potatoes on the baking sheet, overlapping and alternating colors. Generously brush the egg whites on all of the potatoes, and then sprinkle with the chopped herbs. 3- Bake the galette at 450 F for 5-7 minutes, then cut into squares and serve. Chef Tip- you can use purple sweet potatoes too, if you have some!